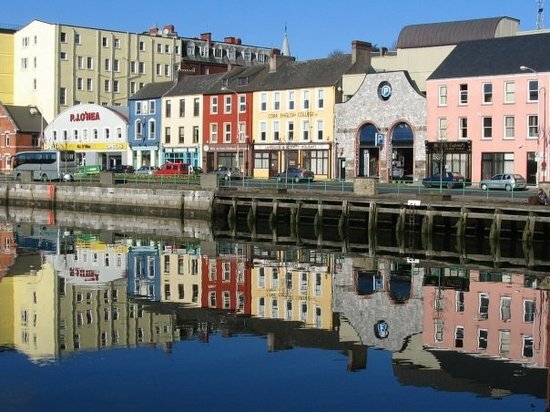 When I was thinking about Cork I was always had this view of colourful houses at the bank of the river. More or less as you can see at this photo. The longer I’ve lived in Ireland the more I learnt about it. I’ve learnt that it has great Jazz Festival and that it’s the food capital of Ireland. You can see the glimpse of food available in Cork in this video. We wanted to go there for long time, but haven’t make it until the this May Bank Holiday. And it was awful! It was awful for a reason not related to Cork itself. We were just very unlucky to be there for two days when it was drizzling all the time. You see in Ireland the weather usually changes very quickly, even during the gloomiest day, we can get 10 minutes of sunshine, when the wind blows away clouds for a minute, but not this time. This time I was incredibly happy when we got a few dry hours. Because of the weather I really struggled with taking photos. Most things looked grey, it was cold and damp. The city itself is lovely. I loved beautiful, custom shop signs, colourful paintings on walls and I wish we could be there when weather is better. You know that I love markets. When you are in Cork you can’t miss the main attraction – the English Market. It’s beautiful 19th century building with many food stalls. There is a nice cafe at the top floor, you can sip your tea and look at the busy market. Fenn’s Quay – cosy restaurant with delicious food, it’s designed as typical French bistro. Everything we tried was delicious, but I really loved Gin & Tonic Dessert and Blue Cheese Mousse. Butter Museum – it’s a tiny museum that will tell you a story of times when Ireland was the largest butter market in the world. Posted in Ireland and tagged ireland, markets, travels. Bookmark the permalink. That market stole my heart for good! I agree, it is one of my favourite ones too Nancy!